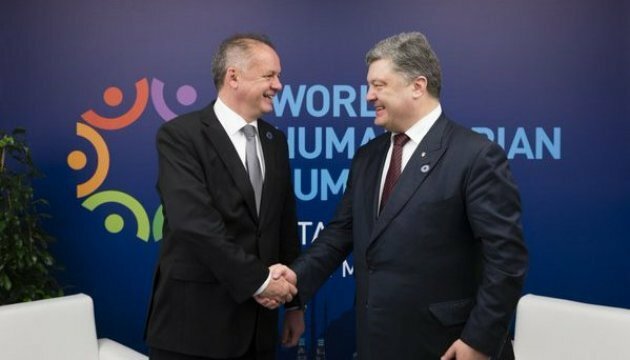 Ukrainian President Petro Poroshenko and President of the Slovak Republic Andrej Kiska have held a meeting in the scope of the World Humanitarian Summit in Istanbul. The sides coordinated priorities for the cooperation in the context of the future Slovak presidency of the Council of the European Union, the president’s press service reports. “The heads of the two states paid special attention to the algorithm of cooperation of the two countries towards the European integration in the context of the Slovak presidency of the EU in the second half of 2016. The sides, particularly, discussed practical assistance of the Slovak side in reforming the Ukrainian economy, as well as its support of decisions taken by the EU governing bodies regarding the introduction of visa-free regime for Ukrainian citizens,” reads the report. In addition, the two sides exchanged views on the major issues of the agenda of bilateral relations and international cooperation.